In the upcoming 7th World Junior Wushu Championships in Brasilia, Team Singapore (Youth) will be sending our nation's twelve strong for this competition. In alphabetical order, Team Singapore (Youth) consists of Berlynn Ng, Chan Geng Yeam, Heidi Kong, Isabel Chua, Josephine Lee, Kimberly Ong, Le Ying Shuen, Malcolm Lai, Nicholas Loh, Nicholas Ngooi, Ong Pang Jan and Randall Lim. This time, the team is led by Team Manager, Ms Tan Sook Ching and Coach Zhang Feng. These athletes are specially selected from the existing youth team from the Singapore Wushu Dragon & Lion Dance Federation. Having been through months of intensive training, our athletes will have a chance to outshine their international peers in Brasilia. This will be a tough competition for them as they will meet opponents from countries such as China and Russia, which are the traditionally strong countries with outstanding athletes. Xuan Sports is also proud to have six of our athletes among this team. This shows the strength of our academy and our ability to bring our athletes to the top level. In the picture above, our athletes took the picture with Coach Winston, who has specially made the trip down to the airport to send them off. Among the athletes, I am sure some of you might have spotted Coach JunMing. He has been bestowed the duty as an International Judge in this competition, which explains why he is travelling with the athletes as well. 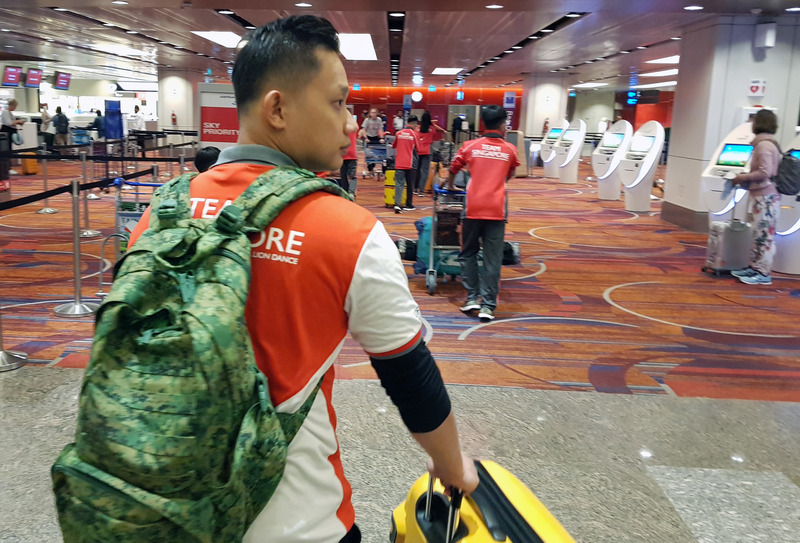 We send our best wishes to Team Singapore (Youth) and may they have a safe trip ahead. For the rest of you, do watch this space for updates from the 7th World Junior Wushu Championships!